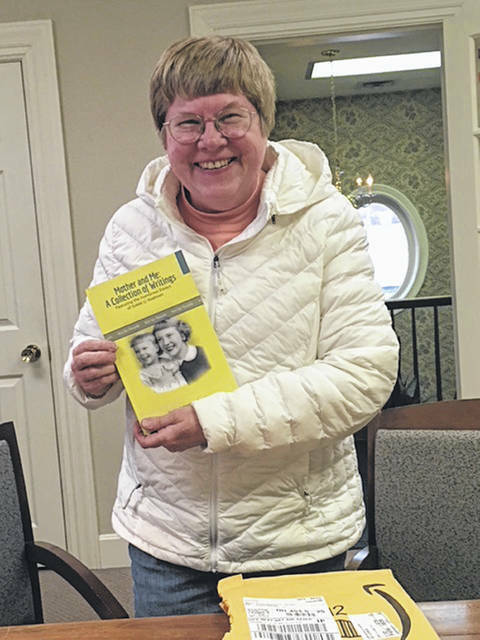 Elaine Schweller-Snyder, of Sidney, can’t contain her enthusiasm as she shows the proof copy, fresh from the publisher, of her book, “Mother and Me: A Collection of Writings,” in the offices of Creative Marketing Strategies in Sidney in December. Elaine Schweller-Snyder’s book is available in print and digital formats at Amazon.com. But it’s the last line of “Mother and Me: A Collection of Writings” that tells readers what they most need to know about the author and her subject. “Of course, there will always be only one famous Adele in my book,” wrote Elaine Schweller-Snyder. 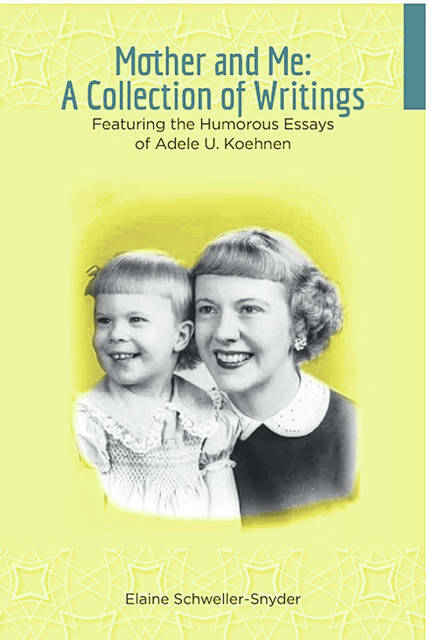 The clever double-entendre comes at the end of Schweller-Snyder’s loving tribute to her mother, Adele U. Koehnen, who wrote humor columns and feature stories for the Kettering-Oakwood Times, the Dayton Daily News and other publications for some seven decades. Schweller-Snyder, a Sidney Daily News contributing writer herself, has published a collection of Koehnen’s columns. But, as the book’s title suggests, the publication isn’t just about Koehnen. It is also a memoir of Schweller-Snyder’s life and the deep friendship mother and daughter shared. And it’s a salute to the 1950s and 1960s, when many of the columns were written. They take readers back to a time when housewives crafted Christmas decorations and hostesses served molded aspics. “Who makes a Jello mold (these days)?” laughed Schweller-Snyder, recently, when she talked with the Sidney Daily News about writing the book. The tribute began as an idea in spring 2018 and came together in a brief eight months. “I have all of her stuff. I have all of it in boxes. After my dad died, she was cranking it out,” Schweller-Snyder said. Koehnen wrote as a free-lancer. She would send columns and queries to editors of all kinds of magazines as well as to the Dayton newspapers. In the days before email, that would involve sending hard copies along with self-addressed, stamped envelopes for a reply. “The mail would come and it would be another rejection,” Schweller-Snyder said. But there were enough acceptances, especially by the Dayton Daily News, added to her 11 years on the staff of the Kettering-Oakwood Times, to make Koehnen’s name well known throughout the southwestern Ohio region. The book was “a way of bringing her work to a new generation,” Schweller-Snyder said. “Mother and Me” puts more than 50 humorous columns together for the first time. Schweller-Snyder has ordered them into chapters and added several pages of family photographs. “A lot of photos when I was young were on slides,” she said. She went to the Internet to find out how to transfer a slide to a digital photo: cut a hole in a sheet of paper. Shine a light through the hole onto a slide. Photograph the slide and make the photograph digital, print it out, scan it to a disc. “It worked better on some than others,” she said. Schweller-Snyder also put into the book a handful of her own columns. And she deftly leads readers into her mother’s world through thoughtful, chatty introductions to chapters and to some individual columns. “It was fun writing the commentary,” she said. “There’s nothing funny about being under the weather with the flu or the common cold — or so you would think,” Schweller-Snyder writes before “Pink Pills for Pale People.” “While reading ‘Women Would Rather Shop Than Go to the Moon,’ you must remember that there used to be clerks who would actually wait on you and bring you a different size or color if you requested it,” she explains. “As Mother wrote in this piece, women’s fascination with the tanned look was not always so popular,” leads into “Does Anyone Sit in the Shade Anymore?” in which Koehnen harked back to Victorian days. Not all of Koehnen’s essays are stuck in the past, however. In fact, most of them touch on topics and issues that are timeless: family picnics, problems with pets, raising children, keeping up with technological advances, housekeeping and holiday stress. The compilation of them, though, is a book about mothers and daughters. And it’s Schweller-Snyder’s contributions that reveal how very close she and her mother were. An only child, Schweller-Snyder grew up in Dayton, earned a Bachelor of Science in music education from the University of Dayton and a Master of Music Education from Bowling Green State University. She chaired the music department and was the band director at Lehman High School for 36 years, retiring in 2014. Her father, Robert Schweller, died suddenly in 1969, when Schweller-Snyder was 18. Writing her columns got the widow through her sadness, and several years later, she married John “Jack” Koehnen. They were together for 32 years, until he died in 2008. The columnist lived to be 91 and kept putting pen to paper and fingers to keyboard right up to the very end. Schweller-Snyder writes with fondness of hard times in her mother’s life and in her own — her husband, Chip Snyder, died in 2017. She admitted that it was really difficult to include the column she put last in the book. Titled “The Cookie Cutter Tree,” it tells the story of mother and daughter’s first Christmas without Schweller. Although Koehnen wrote it in 1989, it has never been published until now. “I debated about ‘The Cookie Cutter Tree.’ It took her 20 years to write it. I prayed about that. Every time I read it, I cried. I cried as I was typing it,” Schweller-Snyder said. In the book, that piece couldn’t be anywhere but last. But the “Mother and Me” author didn’t want to close a book of humorous columns on a sad note. So she added a postscript about well known Adeles, ending with that line about her favorite one. “Everybody who writes a book — it’s a very personal thing,” said Mary Beth Monnier, owner of Creative Marketing Strategies in Sidney, who designed the book. It was to Monnier that Schweller-Snyder rushed when the first proof copy arrived in the mail. The author had opened the envelope containing the book and burst into tears. “It was an emotional ride on all levels,” Monnier said about the Schweller-Snyder’s effort to compile her mother’s writings. “I was happy to help out with that.” Monnier formatted and styled the material Schweller-Snyder had put together and prepared it not only for a print edition but for an ebook, as well. She also was one of the first people to read it in manuscript form. “When I read it, I was sorry it was over,” Monnier said. Published by Amazon’s self-publishing wing, Amazon Kindle Direct Publishing, “Mother and Me: A Collection of Writings” is available at Amazon.com in print for $12.95 and as a Kindle download for $4.99.